We went off to see The Theory of Everything yesterday – something our new friends from The Plaza said we had to see. And then I’d like to tell you about this new appetizer that I made that was really different, delicious, and surprising. I think it would be a great a addition to your New Year’s Eve or New Year’s Day celebrations. Later, I’ll tell you all about our Christmas dinner with a terrific new salad, but here’s the New Year’s Crostini Appetizer Recipe with Roasted Grapes. But first, let me tell you this wonderful story – an only “in New York City” story. Could have definitely been a Woody Allen movie. The day after Christmas, we went to see The Imitation Game at the Paris theatre, across the street from The Plaza. After the very crowded (where did all these people come from?) movie, my husband, Steve, asked if The Plaza was still a hotel. I said yes, partly, and partly condos and then suggested we go have a drink there before heading home. So there we went and were ushered to a round table right next to a lovely couple who immediately engaged me, (Steve had gone to the bathroom), in conversation, asking what brought me to The Plaza, thinking I was from out-of-town. Well one thing led to another and here we were, the four of us talking for nearly an hour – about life, business, and the secret to a wonderful life. He was 86 and she was 82 and let me tell you, they both looked amazing!!! (I wanted to ask what brand of neck cream she used.) Seriously beautiful, she looked more like 62. They lived in The Plaza – a dream of hers since being a little girl, raised in New Jersey. Her first husband, as she said, dropped dead in front of her at the age of 29. She was 28, with 2 kids. (Can you imagine?) Then, family members recommended she go to the Concord for a vacation, to possibly meet a nice Jewish man. (The Concord – the precursor to JDate!) And that she did, and met Bert, (I have changed their names as I didn’t ask permission to tell their story.) and now they’ve been married for 52 years! Bert made a hugely successful insurance business in the ensuing years, with his wife helping him at his side, hiring his sales force of 250+ people. So Bert goes on to say that there are three things necessary for a very happy life. One, you must have close family and friends; two, good health; and three is: money! You need money to do the things you need to do and to be able to give it away freely to help others. He said the more you give away, the more comes back to you. Bert, you know, is absolutely right! Oh and one more thing they said that they do. They tell each other they love each other, many times, every day, and even more so now as they’ve gotten older. What a wonderful couple. May you all meet people like this who inspire and delight you in your travels of life! On to my appetizer – this could be a great starter to your next holiday meal and perfect for New Year’s Eve. The basis of this recipe came from a recent Food and Wine magazine, but of course, I have changed it. The roasted grapes end up looking like olives so this can be a delightful sweet surprise when you bite into it as the roasting only heightens the sweetness of the grapes. Isn’t this just so pretty? Preheat the oven to 400°. On a parchment paper-lined baking sheet, toss the grapes with the vinegar, rosemary sprigs and 2 tablespoons of the olive oil. Season with salt and pepper and toss to coat. Roast for 15 – 20 minutes, stirring occasionally, until the grapes are softened. Meanwhile, spread the pine nuts in a pie plate and roast in the oven for 6 to 8 minutes, until golden. Brush the baguette slices with the remaining 1 Tbs. of olive oil. Arrange on a baking sheet and toast for about 8 minutes, until golden and crisp. To assemble the crostini, place the toasts on a serving platter and spread some of the ricotta onto each toast. Spoon the warm grapes with their juices on top and sprinkle with the pine nuts. Top with a drizzle of honey and some lemon zest. Sprinkle the crostini with salt and garnish with chopped rosemary. Serve with LOVE. Enjoy!! What a wonderful story, that couple sound amazing, your story reads like a script for a movie. I love roasted grapes, they are delicious it seems to bring out the sweetness and add tremendous depth of flavor, paired with the ricotta it’s really an amazing appetizer. Love it. Thanks Suzanne – it was an amazing evening – only in NY would this meeting happen!! 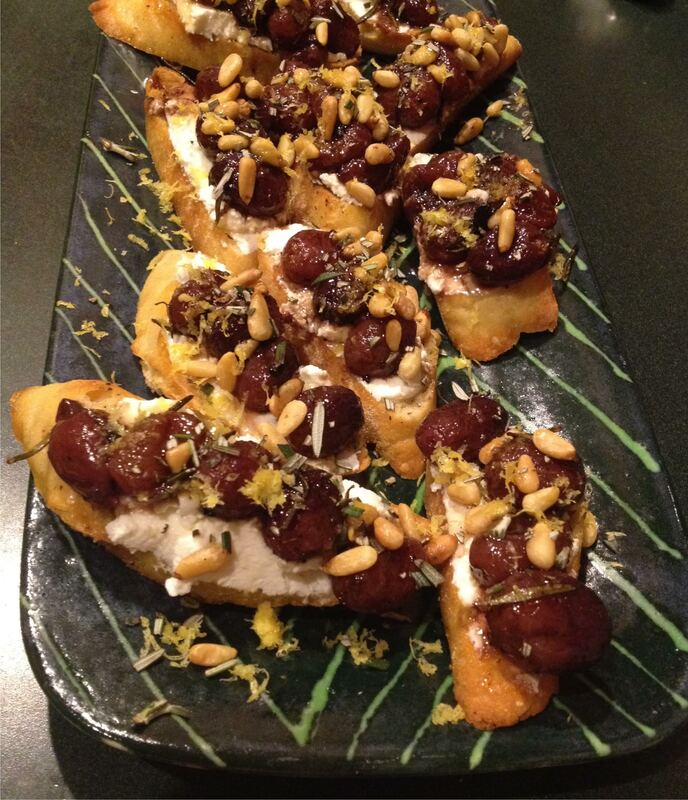 This is the 4th roasted grape crostini I’ve seen and I believe that’s telling me to get in the kitchen and make this! uh oh – are people copying me?? 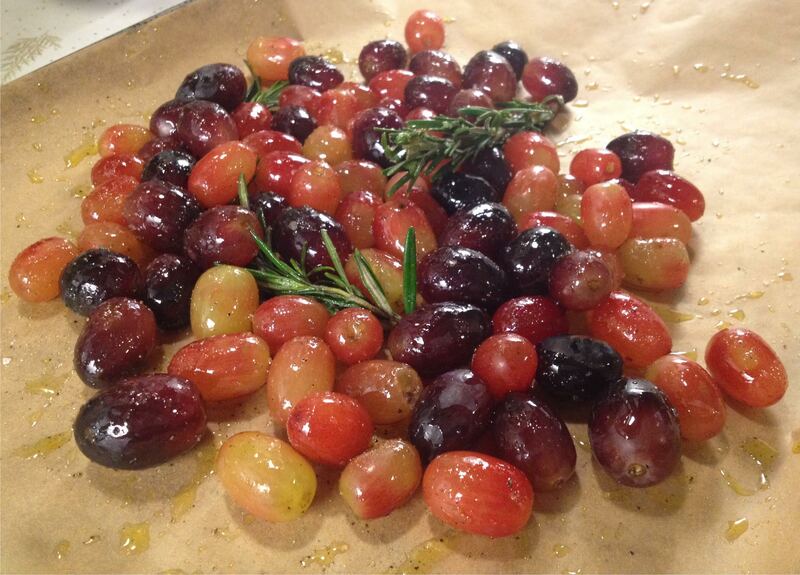 Those rosemary roasted grapes are so colourful and pretty! Yes Angie – they were so beautiful to work with! Margot | Gather and Graze recently posted…Our New Year’s Gingerbread House! What a wonderful looking appetizer. Grapes are so tasty when cooked. Yes Greg, they are SO tasty when cooked!! Happy New Year!! Roasted grapes! What an great idea. Sounds like you’ve been up to a lot lately! Yes!! It’s been fun! Happy New Year Amanda! Thank you Chris!! Happy New Year to you too! !